There are 1 cat videos tagged with deer. You know what’s cuter than a baby deer? 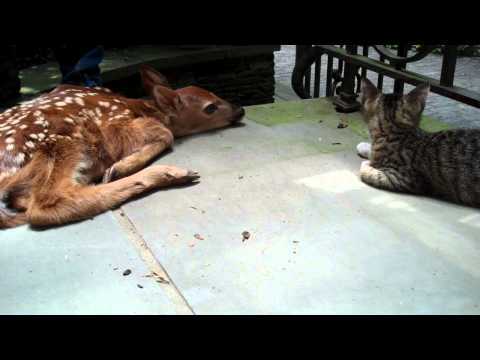 A baby deer… and a kitten! Miro (named after the Spanish artist) got to meet a new friend, someone only less than 48 hours old. While the deer still couldn’t walk, that didn’t stop Miro from wanting to play with him. Toying with the deer, Miro paws at his constantly in an effort to get the deer to react to his newest playmate. Miro does this to the point where his owner calls him a “bully” for the constant barrage of pitter-patter paw work Miro is doing to the fawn. The deer is still unable to walk and all Miro wanted to do was play with him. Pawing at him constantly, Miro’s owner calls him a “bully”. One thing’s for sure, Miro didn’t seem to know what to make of his newest forrest buddy.